Picked fresh from the farm to inspire hope for brighter days ahead, the Blooms of Hope by Better Homes and Gardens®, displays rich blushing color and a fresh from the garden appeal. 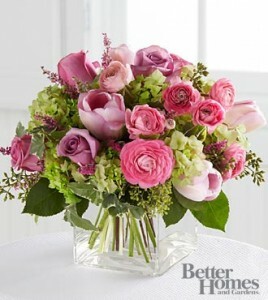 This arrangement brings together the soft, graceful hues of lavender, pink and green creating an unforgettable flower bouquet for a get well, thank you, birthday or anniversary gift. 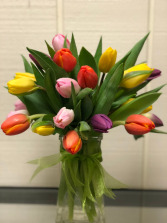 The Rush of Color Assorted Tulip Bouquet will bring a bright splash of color to their special occasion or celebration, sending your best wishes across the miles to brighten their day!. 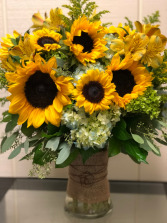 Our finest Premium tulips arrive in assorted colors to create an incredible flower arrangement. 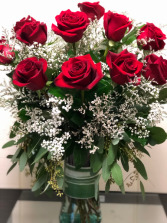 Presented with a clear glass vase this tulip bouquet will be the perfect way to celebrate a Holiday or birthday, express your congratulations or thank you wishes, get well sentiments or Just Because! !